We love maps! Our shelves are filled with atlases, my kids have maps on their bedroom walls, and we collect maps when we travel to help us remember the places we visit. This year, as part of our middle/high school geography course, my kids are even creating their own atlas. For our most recent map project we decided to combine two of our favorite things – maps and food – to make unique maps we could learn from and then eat! 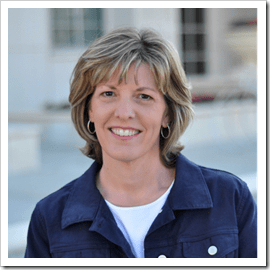 Are you ready to learn how to make an edible map? Over the years we have found many creative ways to learn with maps. We have added hands-on map activities to our history lessons, book club meetings, and family vacations. When our kids were younger we made salt dough maps. We have also followed Kris’ suggestion for making edible cookie maps. 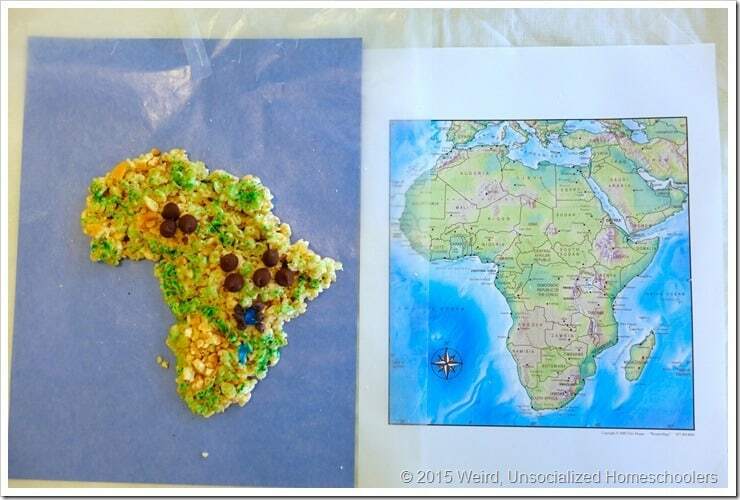 When my kids were hungry for something new we created edible physical maps of continents using crispy rice treats and candy. Step 1: Make crispy rice treats. In a microwave-safe bowl, microwave butter and marshmallows on HIGH for 1 minute. Remove and stir. Return to microwave for 20-30 seconds or until melted. Quickly add cereal, stirring until all pieces are evenly coated. Place a piece of wax paper on a cookie sheet. Using the baggie as a “glove” coat the wax paper with a small amount of butter. Turn cereal/marshmallow mix onto buttered wax paper. We pressed the mix lightly to form a thin layer, but we didn’t press the mix too firmly together. Step 2: Form crispy treat maps. Place printed continent map on a table/counter top. Cut a piece of wax paper a little larger than the map. Place the wax paper on top of the map and tape to the flat surface. Using the same baggie, rub a small about of butter on the wax paper, over the continent shape. With the baggie still on your hand, place crispy treat mix on the wax paper, shaping it to cover the continent outline. Step 3: Decorate with candy to represent landforms. Slide a piece of blue card stock under the wax paper to represent the ocean. Label landforms by writing the name of the city, body of water, mountain range, etc. on a small piece of card stock and attaching to a toothpick with tape. Place the toothpick on the appropriate place on the map. Add/mold additional crispy treats in needed areas to represent varied terrains. Be sure to take photos of your creation before eating! Hands-on map activities help kids take a little extra time to explore details such as the landforms and terrain that make each continent unique. Adding in a few tasty treats will help to make your child’s learning experience even sweeter. Oh how fun! Bringing geography to the dinner table! Thank you! Absolutely love this! We are studying U.S. geography and right now we are on the state of New Hampshire. So excited to give this a try today! This is a great idea! Am hoping to do with a group of 15 kiddos. It looks like your continent print outs were on standard 8-1/2 x 11″ paper. How many continents did you get out of one batch of your recipe? Thanks! The batch of rice crispy treats would typically fit into a 13″x9″ pan and be about an inch thick. I guess it would depend on how thick your students made their maps to determine how many continents each batch would make. I would think with the variety of sizes of the continents you might be able to get one of each from a batch (assuming you are using printouts on 8 1/2 x 11 paper.